Nebuchadnezzar creates a large golden statue and commands all men in the region to worship it, when they hear “…the sound of the cornet, flute, harp, sackbut, psaltery, dulcimer, and all kinds of music…” (Daniel 3:5). Those who choose not to worship the golden statue that was made by Nebuchadnezzar “…be cast into the midst of a burning fiery furnace.” (Daniel 3:6). A few Chaldeans came down to Nebuchanezzar and accused some of the Jews of not worshiping the statue, mainly Shadrach, Meshach, and Abed-nego. 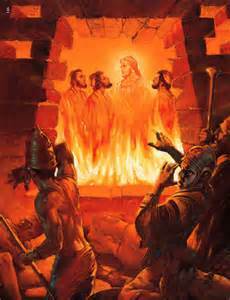 This enraged Nebuchadnezzar and commanded that all three men be placed in the midst of the fiery furnace. Now because Nebuchadnezzar rushed them to the furnace, they did not have time to cool the furnace enough to get the men into the furnace safely without hurting the guards. The furnace however was so hot that upon shoving the men into the furnace one of the guards died from the heat! All three men (Shadrach, Meshach and Abed-nego) fell into the midst of the furnace, but to everyone’s astonishment, they were still alive and walking around the furnace! Nebuchadnezzar commands that the men be taken out of the furnace and again to everyones surprise there was not burnt clothing, burnt smell, or even singed hair! They were perfectly fine… Nebuchadnezzar promoted the men in the land of Babylon and commands anyone who says anything against the God of these men, to be put to death. Nebuchadnezzar’s decree: “How great are his [God’s] signs! and how mighty are his wonders! His kingdom is an everlasting kingdom, and his dominion is from generation to generation.” (Daniel 4:3) Nebuchadnezzar recounts a dream of a mighty tree, which a watcher from heaven orders to be chopped down, and its stump bound with a band of iron and bronze. It is to be made wet with dew, and be with grazing beasts. Daniel interprets this dream: Nebuchadnezzar will be humbled, and eat grass like oxen. Daniel’s interpretation if fulfilled that very hour: Nebuchadnezzar is driven from men and eats grass. His hair grows like eagle’s feathers, and his nails like bird’s claws. He falls into madness, but learns that the Most High rules and sets the rules of men over earthly kingdoms. Nebuchadnezzar is finally restored to power, and praises God. This entry was posted in Daniel, Old Testament and tagged abed-nego, Babylon, Daniel, God, Meshach, Nebuchadnezzar, Shadrach, Shadrach Meshach and Abednego. Bookmark the permalink.